I’ve written about grassroots attempts to build empathy, embrace nuance, and engage in community conversations in previous posts. Some of my perspectives come from an attempt a friend and I are making to address political polarization right here in Denver. Enter Building Bipartisan Bonds. We started with two simple premises: 1) in spite of our political differences, we actually have a lot more in common than we think, and 2) small-group discussions with people who think differently than us are a great way to bring people together. 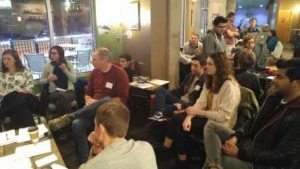 After much back-and-forth and numerous texts, emails, Facebook posts, and phone calls, in September 2017 we managed to assemble a politically diverse group of 25 Denverites in a small-but-cozy coffee shop basement. Literally, all we did that first meeting was to go around the room, introduce ourselves, and provide thoughts on the prompt, “What does community mean to you?” The responses kicked off a riveting discussion, with very little facilitation needed. While some spoke about ethnicity or culture as forming their conception of community, others expressed a desire to join communities with those who share similar values. Eventually, the conversation veered into how to reconcile these different visions of communities, and how to feel a part of something bigger than oneself while also maintaining space for disagreement. The reaction was overwhelmingly positive. Participants were growing increasingly frustrated with the growing divisions – or, to some, perception of divisions – between community members, while at the same time yearning for spaces where civil dialogue can take place with those who have different backgrounds and points of view. In the surveys we passed out afterwards, many individuals who self- identified as progressive indicated that this was one of the first times in recent memory that they had engaged in an open, friendly atmosphere with a conservative, and vice versa. It soon became clear that we were on to something. 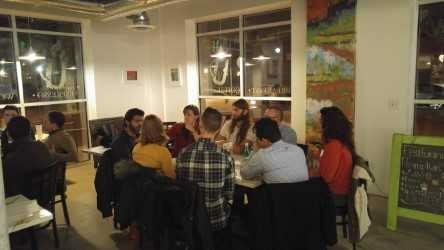 Since that time, we’ve had three more lightly-facilitated Meetup events. During our second meeting, we directly took on the thorny topic of political disagreements, ideological bubbles, and the self-segregation of many of our communities. Our third meeting saw us attempt to visually map out on paper different political categories, such as “Independent”, “America First”, and “Socialist”. Finally, each group tried to come to a consensus on tangible policy proposals related to homelessness during our most recent meeting. All of the Meetups have involved dividing participants into politically-mixed small groups, then letting an activity or list of discussion questions guide them through the ensuing dialogue. Before the night was over, one member of each group would briefly lay out what type of conversations they engaged in, what some of the differences between group members were, and where they found common ground. Some of us would eventually continue the friendly debates and deliberations informally at a bar nearby. 2) Icebreakers are some of the most efficient ways to build empathy. A catch-22 similar organizers often run into is how to make participants feel comfortable enough to share their views with others, all while trying to ensure that they interact with different people each meeting. We’ve found that well-crafted icebreakers within each small group work wonders, and help build camaraderie before participants start their discussions. We’re especially fans of the Marshmallow Challenge, which has the added benefit of subsequently allowing us to go over its empirical results showing greater success among those who are less worried about social approval. 3) Organizers should focus their pre-meeting attention on those who are less comfortable with airing their views. To maximize attendance, we didn’t start most of our events until 15 to 20 minutes after the first attendees arrived, and this gave those who weren’t late time to chat and/or network. However, chatting and networking is more difficult for some, particularly when they don’t know anyone else present. Recognizing that I’m a bit introverted at times and naturally one of these people, we made an effort to make everyone feel welcome as soon as they walked in, and focused our limited pre-meeting time on people who looked like they might be a bit shy, hesitant to open up, or even ready to walk out if we didn’t get started soon (this actually happened during our third Meetup). 4) Consider inviting local nonpartisan groups to speak and participate. You might be surprised by how many groups are working for nonpartisan/bipartisan political reform in your communities. At least here in the Denver/Boulder area, there are quite a few. We experimented with inviting a couple of them to speak before our second meeting, and it worked splendidly. Steve McIntosh from the Institute for Cultural Evolution and Tyler Fisher from Unite America (formerly the Centrist Project) gave very pertinent remarks on our growing political polarization and what we can do to counter it, as well as participated in our small-group discussions afterwards. Somewhat similarly, to kick off our discussions on homelessness and what to do about it during our fourth meeting, we had the City of Denver’s homeless services coordinator as well as a representative for a prominent homeless rights organization speak about the policy proposals at hand before the groups began to tackle them. They also stuck around and helped each group with background information during their discussions. Additionally, Victoria Fann’s June post about her experience hosting a Ben Franklin Circle comes to mind. These meetings also center around small-group discussions (only up to 12 members), but on the Founding Father’s “13 Virtues” which range from the ever-pertinent “industry” and “humility” to values that might seem archaic today but can still spark a deer discourse, like “cleanliness” and “chastity”. Starting a group to promote civil discourse can come in many shapes and sizes. Not all directly touch on political polarization, as our Meetup group does, but when done well, all can help us increase dialogue, empathy, mutual understanding, and, ultimately, consensus building in our communities. Excellent article Kevin! It is great to see communities across the country having dialogues that can lead to positive change. I’ve had the pleasure of visiting Denver twice in the last couple of years and even as a visitor I found that people were open to having conversations that were beyond what some may call a comfort zone. Here in Charlotte, we are continuing to have community dialogues and planning engagement activities that build stronger relationships. I would be interested in an update on your efforts over the coming months and seeing how this initiative evolves based on some of the lessons learned. Thanks for the comment, Traci! Yes, I’ve been pleasantly surprised by this willingness for discomfort (under the right dialogue conditions) since I moved here four years ago. Absolutely. We plan on having another Meetup in 4-6 weeks. I’ll definitely update you on how it goes. Kevin, Traci – I’m making a note to check back in early/mid-December, per Kevin’s comment: We plan on having another Meetup in 4-6 weeks.